There is a growing concern that felt-soled waders act as pathway of spread for aquatic invasive species. Trout streams and waters throughout the state are at risk. What are felt-soled waders and boots? Mud and organisms can become embedded in felt and then get transported to new locations. Felt-soled waders and boots have been popular with individuals working, fishing, or otherwise recreating in rocky, fast moving, and slippery streams and rivers for traction and stability. The felt soles allow for additional traction on slippery surfaces as the fibers form around and attach to the uneven surfaces. Felt is a non-woven cloth that is produced by matting, condensing and pressing wool or artificial wool like fibers. The felt soles are pliable, filled with numerous interstitial spaces, and when wetted or encrusted with mud may stay that way for a period of time. This can be the perfect trap for any small material or organism. Felt soles have been linked to the transport of aquatic invasive species. What makes felt-soled waders a risk for transporting Aquatic Invasive Species? Recent links between felt soled waders and the transport of didymo (an invasive algae species that can smother stream beds and affect freshwater habitat, fishery, plant, and invertebrate communities) and whirling disease (a fish pathogen that can affect multiple fish species) have raised a lot of concern. Felt soles allow for a refuge and mode of transport for numerous invasive animals, plants, and pathogens. 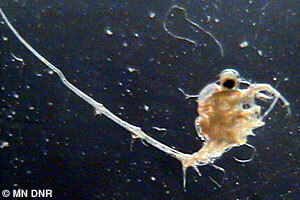 Felt traps small organisms. Disinfectant chemicals cannot penetrate the felt. Felt takes a long time to dry so organisms stay moist and viable. Cysts and spores can survive periods of drying. 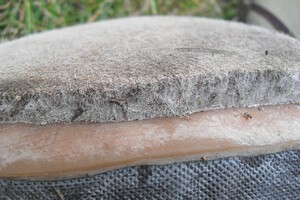 Typical decontamination measures such as cleaning or chemical treatment do not work on felt. Evidence supports that the interstitial spaces of felt soles trap far more invasive species such as whirling disease spores than conventional rubber waders. Felt-soled waders are not prohibited in Minnesota, but are prohibited in Missouri, Vermont, Maryland, Alaska, and New Zealand. However, in Minnesota it is illegal to transport prohibited invasive species such as New Zealand mudsnails and zebra mussels on waders. Use waders and boots without felt soles. Try some of the new slip-resistant alternatives to felt - talk to retailers for the latest alternatives. There are new series of waders and boots that have rubber soles or studs that offer maximum underwater traction. Always clean and dry your waders and boots after use. Replace your felt soles with a slip-resistant alternative. Or alter your felt soles to prevent invasive species movement. If you must use felt-soled waders designate to them a single body of water. Thoroughly clean and dry felt-soled waders and for no less than two weeks or freeze for 24 hours if you must reuse them in another body of water. Always inspect, clean, and dry your waders, boot, and equipment. 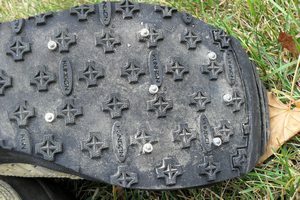 Studded soles can be an alternative to felt soles. The MN DNR does not endorse any particular brand or style of boot or wader.